(Newser) – Walmart says it will be testing its grocery delivery service with ride-hailing companies Uber and Lyft in the next two weeks in Denver and Phoenix, the AP reports. That's in addition to a quiet pilot program that started in March with Deliv for its Sam's Club customers that involves delivery of general merchandise and groceries for business members in Miami. Walmart's test works this way: A customer in one of the test locations orders groceries online and then selects a delivery window. A personal shopper then selects the products, and the team may request a driver from one of these services to go to the store, pick up the customer's order, and take it directly to the customer's location. 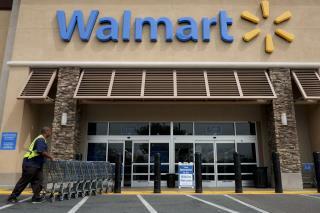 Customers pay Walmart the regular $7 to $10 delivery charge online and make no payments to the driver. Forget the cows milk, how about soy milk? I'm sure it's a possibility, but not to my door! Unless a neighbor orders and the delivery goes to the wrong house. Now you won't see 400 lb Miss Muffy in her sparkly thong and swirling pasties? That's the true WalMart experience. Wally has been competing with Dollar Stores; most cheaper and much cleaner than Wally. Now Amazon is taking its bite. I don't care how WalMart is marketing its goods including its delivery. I stay away from that dive.